Does anyone know anything about this basket? It is one I have had in my collections for quite awhile now, but I know nothing of its origin. I have only ever seen one or two others like it or of the same construction style. It is woven of brow ash, but I am not sure what the rims, handles or base are made of. I have been told that the base is of basswood, but I am not sure if it is like a Nantucket base and had a groove in it for the staves or if it is two pieces of wood sandwiched together with the ribs in between. 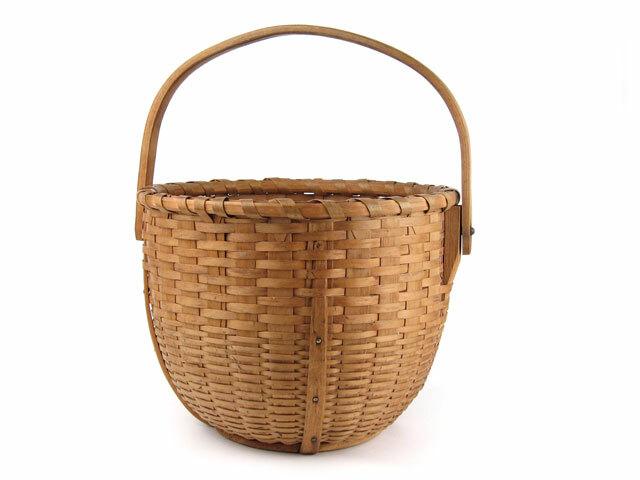 It has a distinctive handle and ear attachment with the brass pin going all the way through the ear and side of the basket. The pin or rivet is peened over a washer on the inside. The handle is not really shaped much in profile, it is basically just a heavy split stick with the edges slightly knocked off, top and bottom. 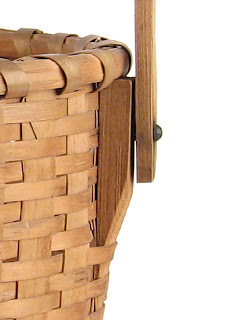 The base has two channels cute a right-angles to accept "ribs" or "splines" that run up the sides of the basket. The ribs are tucked into the weaving and nailed in place. 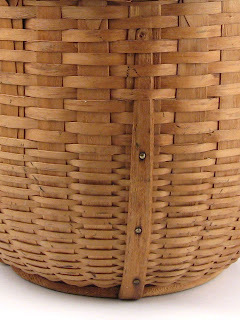 Again the pins go all the way through the body of the basket, but this time are just bent over on the inside. Notice too that the weaving is graduated in size with smaller weavers at the base and wider ones for the top half. One of these days I am going to try my hand at making a reproduction of this basket in maybe a smaller size. As always, there are too many baskets to make and not enough time.